After some basic training or private assessment, you can join our field trip program. We travel to downtown Jackson, Sutter Creek and other public locations. Selected merchants that work with us provide a setting where your dog can practice the socialization skills learned at the ranch, but in an everyday real life environment. 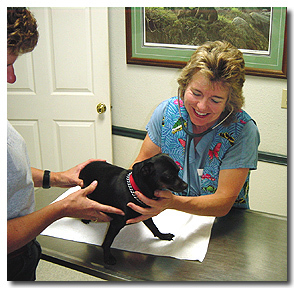 Part of this program will help your dog become a good patient at the veterinary clinic. We will use the heel, sit, auto sit, down and hold position behaviors in a real life setting with many distractions. Your dog will learn to focus on you instead of the surroundings. Additionally, the importance of calmly greeting strangers will be emphasized and practiced. Our instructors are there to help you over any difficulties and will point out areas that need work in training class. 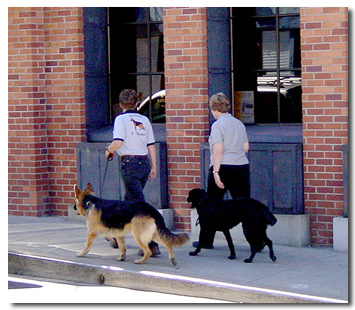 Once your dog is comfortable with the environment, walking downtown with a well mannered companion is a true pleasure! We start with a walk down Main Street. This is where the first part of our training is appreciated. The dogs are walking along with us in the heel position on a loose lead. Notice that we are not being dragged along with the dog trying to stop at every pole or wind his lead around any thing in sight. This makes for a much more pleasant outing. Practicing the exercises learned in class makes all the difference, as new sounds and smells can be very tempting. But having that solid foundation from basic obedience training, the dog usually requires only a gentle reminder to stay in the heel position. 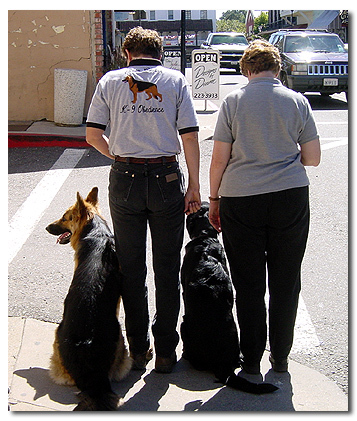 Using the auto sit learned in class, the dogs sit as we stop at the crosswalk. This action is appreciated on a busy street allowing you to concentrate on traffic instead of the dog. If there is pulling on the leash, your attention is drawn from safely crossing. 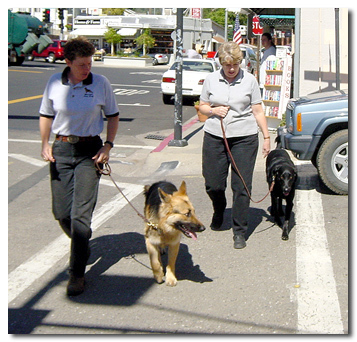 Crossing the street provides good practice walking with a loose lead. Heeling in a distracting environment started in the group classes, and we use that here on our field trip. It will take getting used to for some, but with patience and practice most dogs ignore the cars and enjoy walking along. 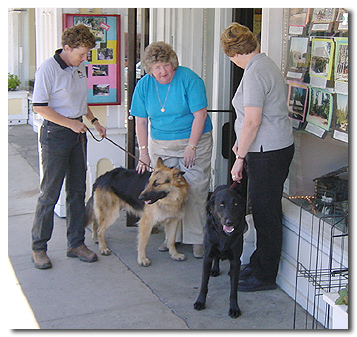 We have arrangements with selected merchants in town allowing us to visit them with the dogs. This provides the opportunity to try new and interesting environments. For many dogs this new experience is a great chance to learn how to cope with different situations. Just like outside, a calm heel on a loose lead and a sit or down when stopped are in order and quickly learned in the stores. After the first visit or two, your dog finds that this is not such a big deal, and they enjoy the change of pace. 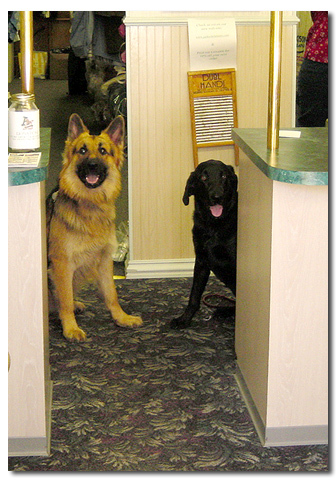 Here are Duke and Sophie waiting for their next customer at the cleaners. They are practicing holding a sit position until called or until their owners return. Heading on down the street, we take a minute to practice holding a sit with all the distractions. 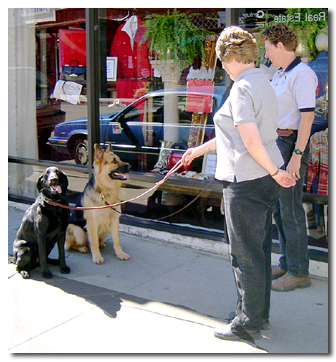 This can be a challenge at first with all the cars and people walking by, but the dogs rely on their training from group class where they were placed in a sit and the class members walked by. As we continue, we meet other folks and the dogs get more practice with their meeting people skills. 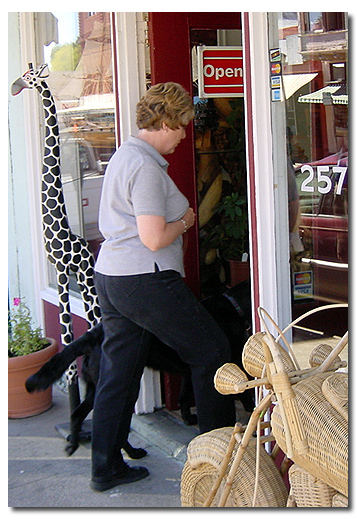 This is a very important step in their socialization training, where they meet strangers in a new and busy environment. The dogs need to remember not to jump up or pull on their leashes, instead calmly wait until they are approached. Sometimes, this takes awhile to learn, but that�s what the field trip classes are for. 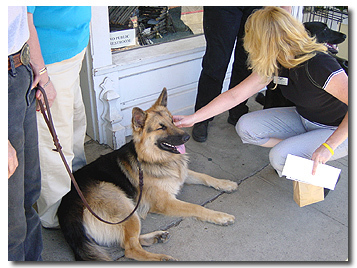 The merchants that we visit enjoy the dogs and are willing to help with the training process. This is Duke�s and Sophie�s favorite part. 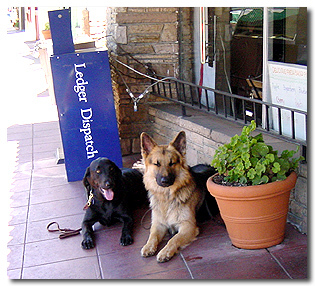 Chance meetings downtown provide a stage for the dogs to show off their new manners, and many folks we meet are Twin Cedar customers. It takes practice and work, but you will be rewarded with a good canine citizen. Here Duke enjoys a little extra attention. Our goal throughout the training process is reaching the point where your dog calmly enjoys outings whether a walk in the country or going into town. Notice the loose lead that is the best measure of success in the training program. Time for a short rest and practice holding a down before heading out of town. This is an extension of the exercise from basic training with the added distraction of being in town. 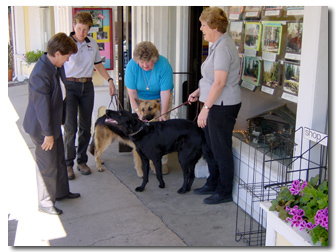 Our last stop is the veterinarian�s office. 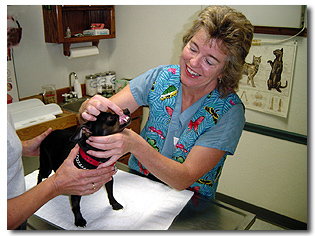 It is very important that your dog be a good patient at the vet�s. 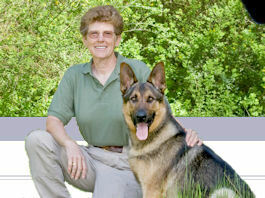 Training allows the dog to gain confidence and lose the fear that generates much of the aggression exhibited when he is handled and examined. A field trip can be planned to address specific issues and problems. These issues are first dealt with in training, with private sessions then group classes. 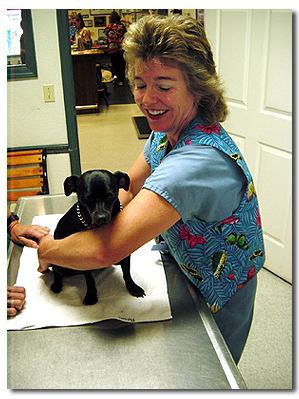 Dr. Pillsbury of Foothill Veterinary Clinic is kind enough to provide a practice exam for Clyde. He had serious anger management issues when going for his vaccinations until he started his training. After an assessment and a few private sessions at Twin Cedar, Clyde moved into the group class. There he continued learning and gaining confidence while learning how to be social and nicely interact with other dogs and people. Now Clyde is a well behaved, if reluctant, patient. Finally we make our favorite last stop for a quick wade in the fountain. It has been a good day with the dogs able to practice their training and the owners were also able to see the training work in real world situations. Training is an ongoing activity that is fun for both the owner and the animal. By going on field trips into different situations, the training is continued in real life situations. As you and your dog proceed through the program, it gets better. Being able to walk downtown amongst cars and people with your dog by your side on a loose lead is a joy. 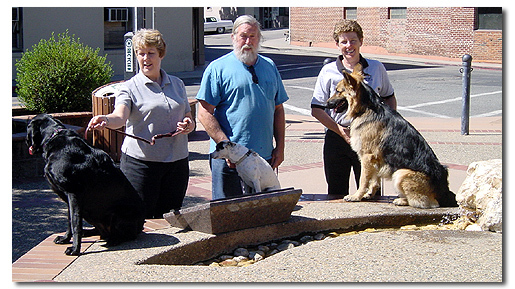 The field trips with a group and instructor build the confidence that is the foundation for a strong relationship between dog and owner for years to come. The field trip program is offered as an option and is another step in developing a well socialized and well behaved animal companion. And he�ll even do well at the vet�s office.